Hey, I made something I can wear!! I always have good intentions of making clothes. 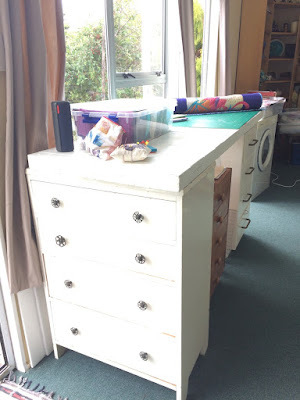 I have several lengths of fabric stashed away, a stack of patterns, lots of links to inspirational podcasts and bloggers who sew beautiful things for themselves. I just never get to it! I'd so much rather sew in two dimensions. I think the other reason is that I just don't know enough about garment sewing and I don't get a great fit the first time so then I give up. But scarves! They are kinda three dimensional but mostly sewn in two dimensions. I can handle that. And they feel good, are an easy way to add an individual touch to an outfit and they always fit perfectly. I whipped one up (really, truly, including hand sewing the tiny bit at the end it took me about 20 minutes) the other day out of a soft Stoff knit fabric. The fabric is very slightly pink and it's got birds on it. How could it not come home with me? Do you know what I love most about this photo? Not that I don't look like a total goober, not that it captures both my wedding present mirror and my first ceramic purchase that I bought 'just because', but also because it shows me next to my kids height marks that we've been marking on the doorway since we moved on board the boat. My 12 year old son is only about 10 cm shorter than me! I didn't use a pattern or tutorial because I've sewed a couple now and have it down pat. 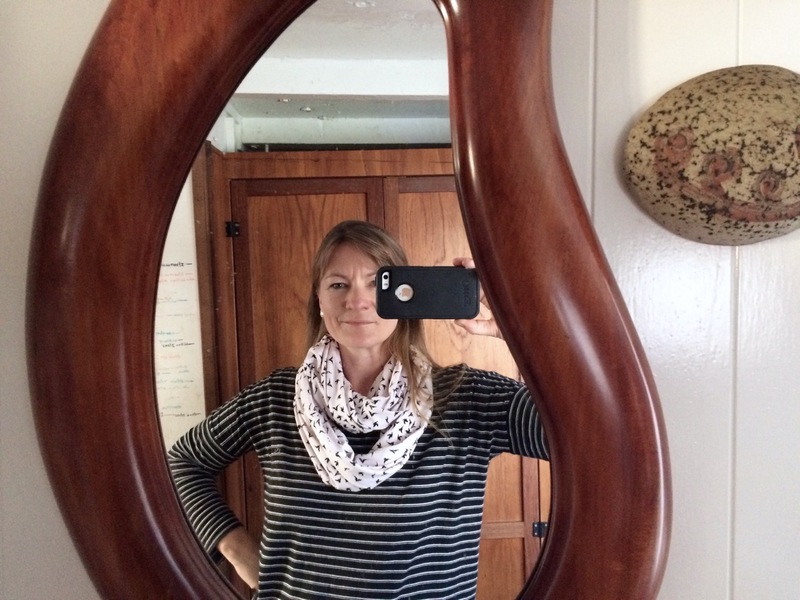 To sew an infinity scarf, you get a long narrow length of fabric, fold it wrong sides together lengthwise and sew those long edges together to get a narrow tube. Then you turn it rights sides out, slip one end back over the tube (right sides facing), until you reach the other end. Sew the two ends together, leaving a small gap for turning. Turn it inside out and then slip stitch the opening together. When you are slipping one end back down over the tube, you can choose to put a twist in it, which is what I did on this scarf. A great interview you should listen to. Lisa Walton, a guest on my podcast a few weeks ago, took the plunge and has started podcasting herself. Being administration vice president of SAQA (studio art quilt associates) and a travelling textile teacher, Lisa has access to some very interesting textile art professionals. Her first interview is with Martha Sielman, executive director of SAQA, textile artist and author. It was a great interview and well worth listening to if you have any interest in art quilts. Martha Sielman has been Executive Director of Studio Art Quilt Associates, Inc. (SAQA) since 2004. 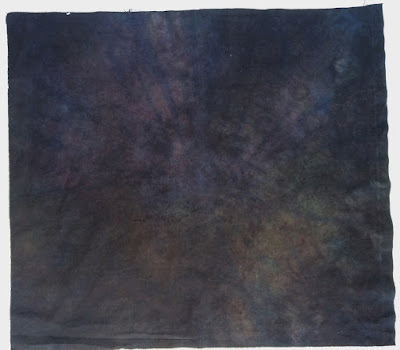 Her career in art quilts began in 1988, when she learned to quilt, and has included more than 20 years of work as a professional artist, author, lecturer, curator, juror, and arts administrator. She is the author of Masters: Art Quilts (Lark Books 2008), Masters: Art Quilts, Volume 2 (Lark Books 2011), and Art Quilt Portfolio: The Natural World (Lark Books 2012). 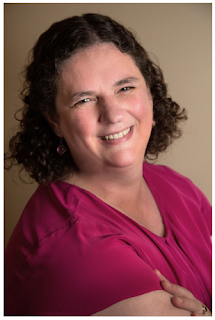 Sielman lives in Storrs, Connecticut, with her husband, five children and two cats. or search for Lisa Walton Chats on iTunes. 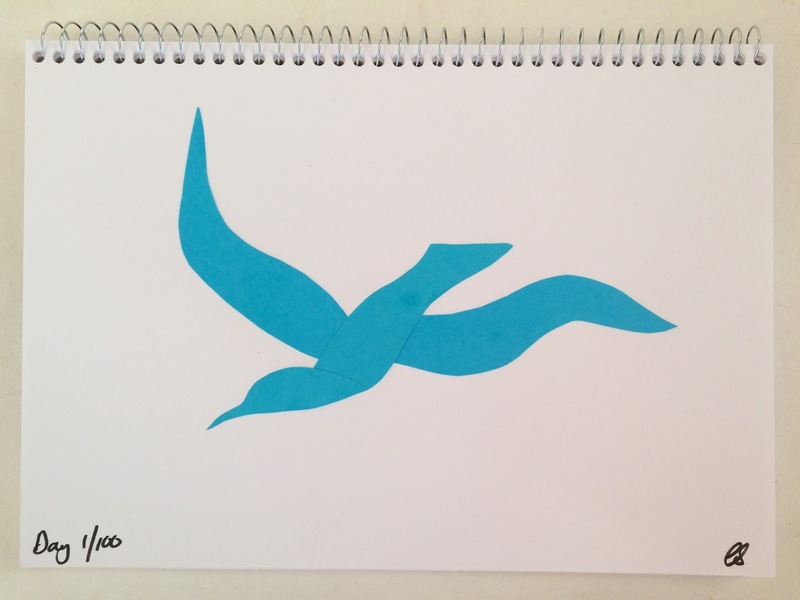 The 22 May was the first day of the NZ 100 Days Project. Except it's not just NZ, there are plenty of people from around the world taking part too. I did it last year and I'm doing it again. This time with a side-kick, my own built-in accountability partner, my daughter. We're both working on the idea of paper cutting. I'm inspired by Matisse mainly, and trying to explore whether I can find my 'voice' or my 'hand' in free-hand paper cutting using scissors. You can read more about my motivations and how I decided on my project here. Day One is always exciting. Will my idea work? Will it look ok? Am I going to come to loathe this after 100 days...or after 20? But so far, so good. Day One was a beautiful day, sitting in the sun with my daughter, discovering with paper and scissors. It was quick and easy because I'd set myself up for success. Having a project that is quite specific helps (less choices to make), having a set size (I've decided to use sketchbook pages as my base), and having all the tools I need in one place (we've made a pack with card, scissors, zip-lock bags for small leftovers, storage for finished words and a glue stick) all contributed. Day Two? Well, that's today, so we'll see! I'll also post now and again to Instagram, you can find my feed by clicking on the Instagram icon at the top left of this page. Diane Anderson is a New Zealand quilter who lives in beautiful Bream Bay, north of Auckland. I first met Diane in person at a workshop with Jeanette DeNicolis Meyer and instantly warmed to her friendly, calm demeanour. 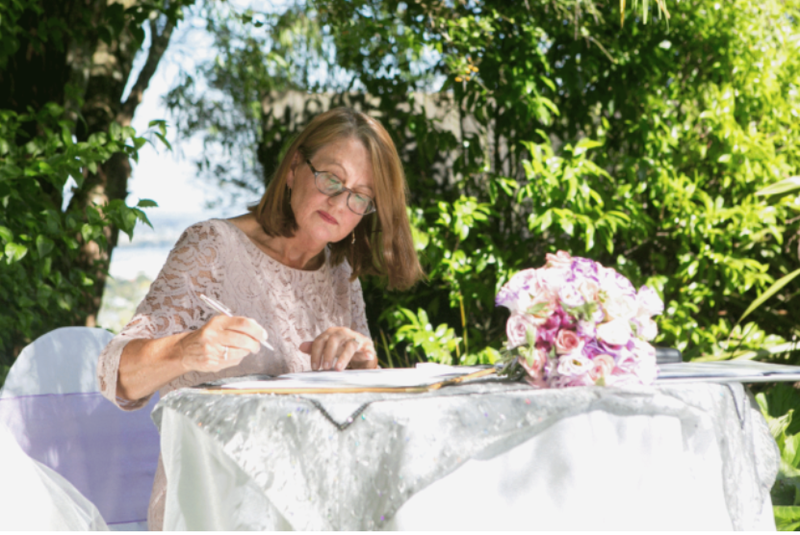 Diane is also a sought-after marriage celebrant, keen gardener, and likes to hike with friends in her spare time. Diane is a mother of two children, a beloved retriever called Stella and a cat called Lola. She will celebrate 40 years of marriage to Terry this year. 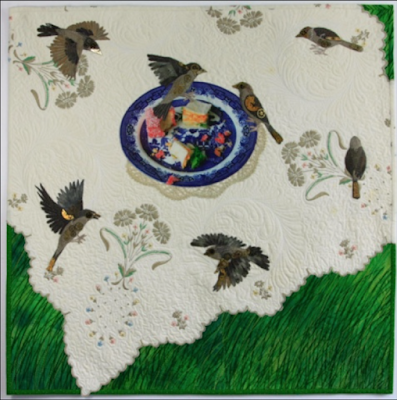 Diane specialises in hand work, including hand appliqué and Amish style hand-quilting. 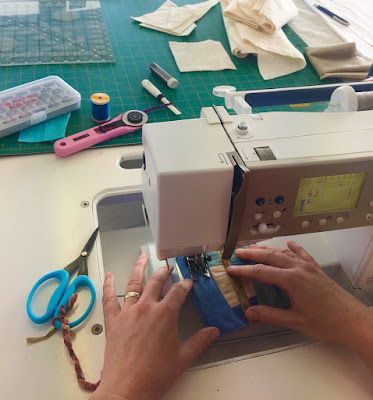 I had a great chat with Diane about where she learnt her style of quilting, about her thoughts on keeping the skill and art alive and her top tips and ideas for learning and enjoying hand-quilting. 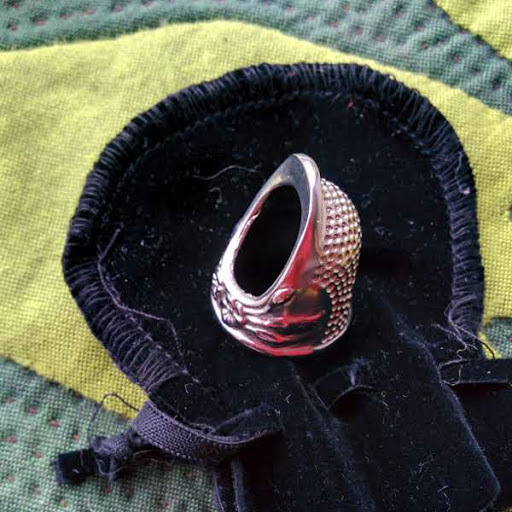 We talk about tools such as the long frames that Diane likes to use, and her favourite thimble, which is a Roxanne Thimble. She also likes Roxanne needles for quilting and hand appliqué. 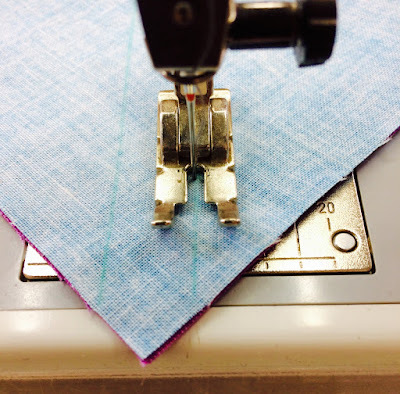 Diane recommends YLI thread for quilting and silk thread for hand appliqué. Diane has travelled extensively, and it was on one of her travels to Houston, US, that she learnt the Amish influenced way she hand-quilts with Ester Miller. 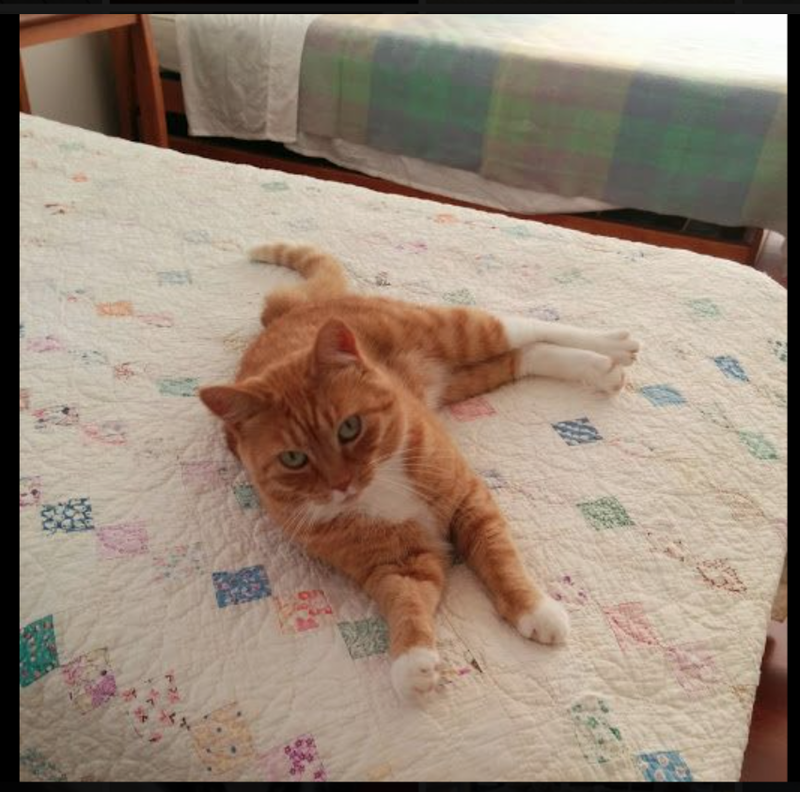 She also loves antique quilts and owns two that she bought in the US and one she found in NZ. Above is Lola the cat on one of Diane's beautiful antique quilts. Diane only quilts for family and very close friends. The amount of time she puts into each quilt means that she very rarely exhibits them and she confesses to often forgetting to photograph them too! The quilt below is Diane's adaption of a Becky Goldsmith pattern that she made for her friend's 70th birthday. Diane lists her influences as Gwen Marston, Pepper Cory, Barbara Chainey, Karen K Stone, Becky Goldsmith, Linda Seward, Jeanette DeNicolis Meyer and Mary Schaefer. The sponsor for this episode is Carol’s Quilts. Visit carolsquilts.co.nz for innovative quilting templates and rulers. I personally love Carol’s squares to triangles tool, which has helped me streamline my process for making ½ square triangles. Thanks heaps Carol for supporting The New Zealand Quilt Show. I've been in my new quilting studio for about six months now and I finally feel like I'm getting some order to the chaos. 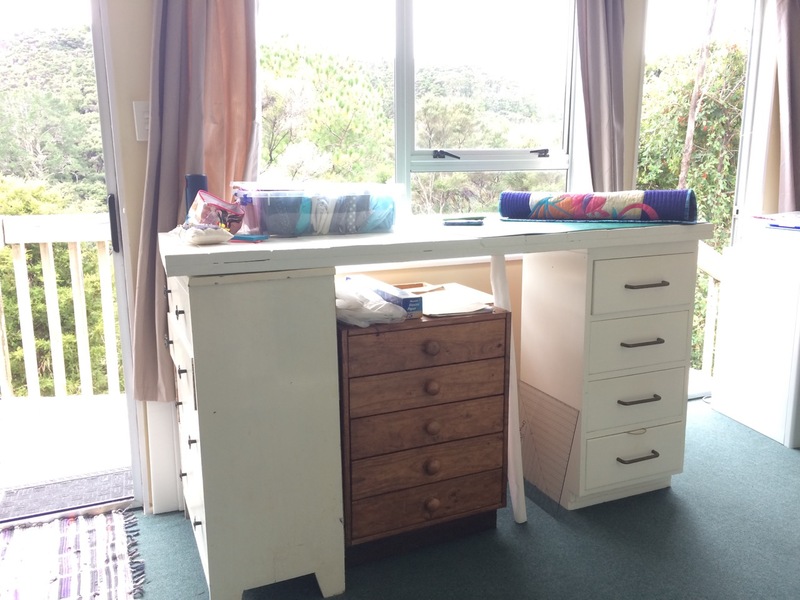 When I first moved in I immediately set up my Sew-ezi sewing machine table and the two trestles I use and got to work. Then everything else moved in around me, clutter happened and chaos began. As we are using it as storage for furniture that can't go on the boat, it filled up pretty quickly and I've been sorting and shifting things around ever since. The flat has two poles in the main room, which really annoy me effect the possible furniture configurations (see here for photos of the empty studio). But I think I've finally sorted out a layout that is working. I can see it staying this way for a little while and today I'm going to show you my cutting station part of the set up. 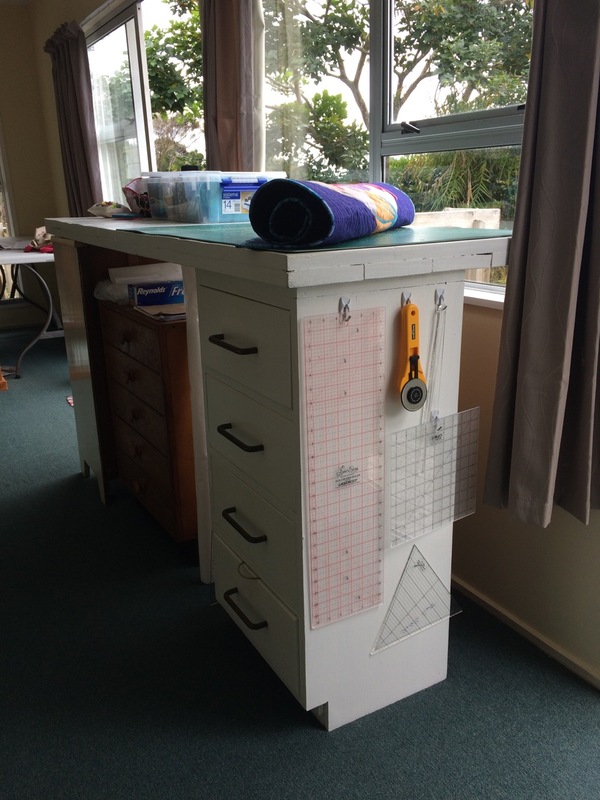 We don't have Ikea in NZ so there was no melding together several kitset units or anything fancy. In my art gallery/studio I had a display table made of an old boat door, painted white and laid across two huge chunky bits of wood. So I set it up in my new studio as my cutting station, but it was too low. 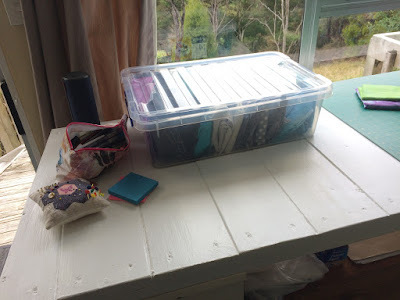 I had a brainwave (probably from seeing all those cutting stations set up on the top of Ikea drawer units) to use a couple of old sets of drawers that I was already using for notions and paint etc. 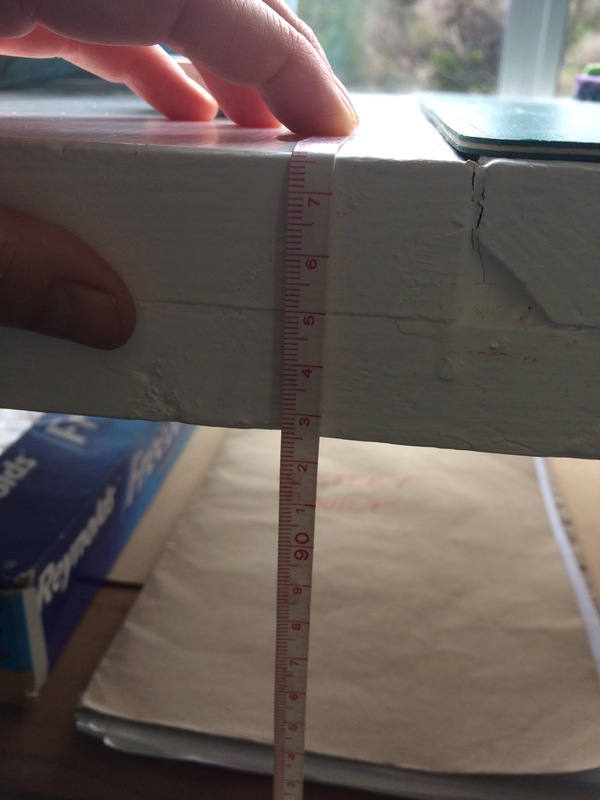 It makes it quite tall, almost 98 cm, but a good height for me at 168 cm tall, especially if I wear shoes! I also slipped another desk unit underneath for extra storage. That consolidated some of the furniture that was taking up valuable floor space in my studio too, an added bonus. 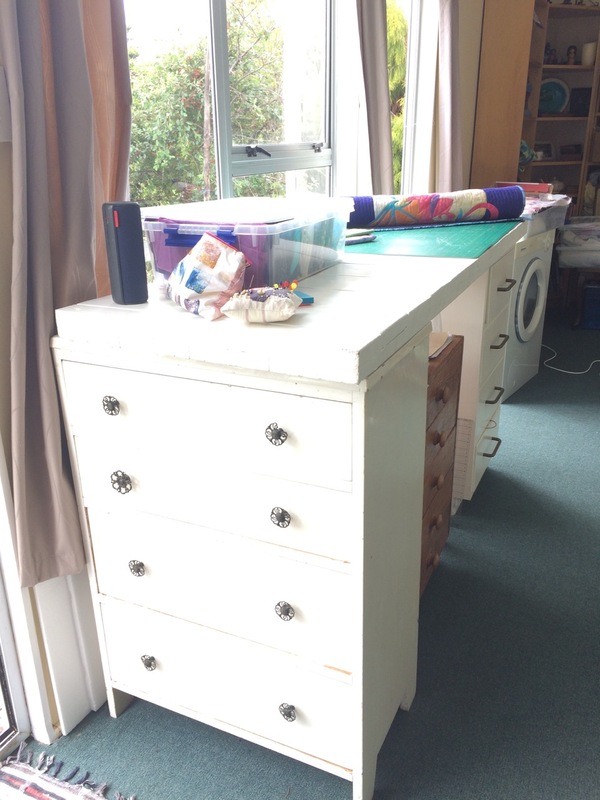 The table top is slightly wider at one end than the other, which is why I have the end unit below turned around and facing out - it gives the table better support. I have my cutting mat on top at one end, and it's a really sunny spot (as you can see by the difficult photography), so when I leave I always shut the curtains so I don't get a warped cutting mat or faded fabrics if I leave them out. I've put some 3M hooks on the other end unit for my most used rulers and my large rotary cutter. I use the top of the table for holding all the necessary junk that collects when I'm cutting a quilt - patterns and notes, fabrics, pins, pencil case - it can become a bit of a mountain of junk but I cleaned it up specially to take photos! The chunky bits of wood went outside onto the deck. They were all natural to begin with so a bit of weathering won't hurt them if I want to use them again. And I think I'll add some more 3M hooks to the other side of the smaller end unit for a few more rulers, a tape measure and my scissors. I'm always doing the 'scissor pat', you know - when you pat down the fabric laying all over the table to find your scissors? Yes, I'd love for it to be bigger. I'd love to have two cutting mats end to end. I'd love to have a table that I could adjust the height of with the push of a button. But until I win Lotto, this is working well. And heck, it's better than using the dining room table! What's your cutting station like? Clare Smith is a textile artist living and working in Tawa, a suburb of the capital city, Wellington. Clare began teaching adult education classes in surface design, applique and Japanese bookmaking at the beginning of 1998, and has now taught at many NZ quilt symposiums, all over New Zealand and internationally including the UK and South Africa. 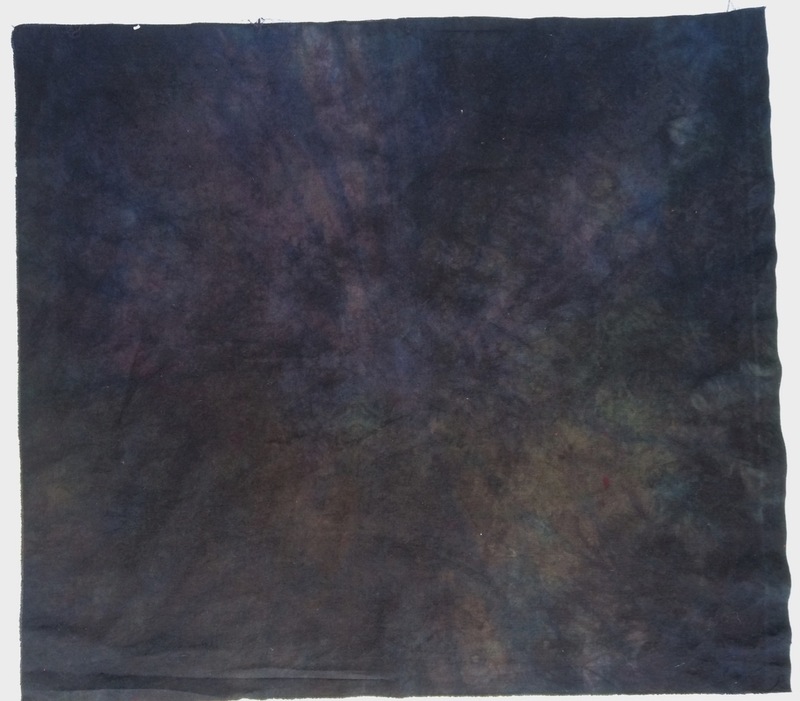 Clare is a talented fabric dyer, including the art of indigo dyeing, she is also widely skilled in other facets of textile arts including machine quilting, applique, pojagi, sashiko, costume design, and pretty much anything else she turns her hand to. The above photograph is Clare's piece called 'Bitter Harvest', which we discuss in the interview. We also talk about Clare's skills and interest in boro, sashiko, pojagi and costume design. 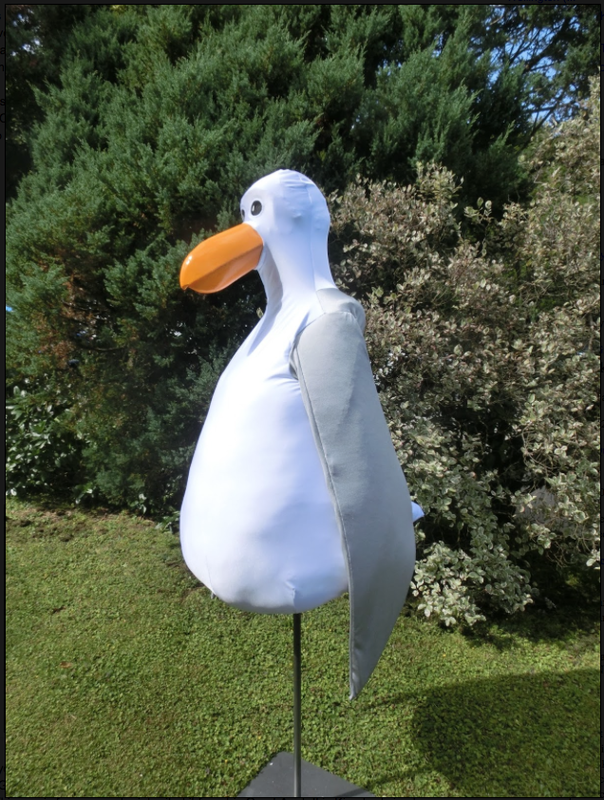 Clare recently made seagull costumes and showed these on her blog for our amusement! Clare's steampunk sparrow quilt (below) was accepted into the Aotearoa Quilters's travelling exhibition called Flight. Thanks for chatting with me Clare! This episode was sponsored by Kerry Glen of Tulis Textiles. Visit Tulis Textiles for high quality batik fabrics, surface design tools and supplies, speciality rulers and great customer service! Kerry also has a Breast Cancer Foundation donation project running at the moment, where she is donating a portion of every 15 degree squedge tool purchased to the foundation to honour her sister and her friend and all other women who have been affected by this disease. Click here to see the quilt made with the free pattern and to purchase the tool. In a couple of days time, the first clue to my first ever mystery quilt comes out over on Carol's Quilts! A little while ago Carol asked me if I'd be interested in designing a six-month long mystery quilt along for her. I jumped at the chance because it's something I've always secretly wanted to do. It's been a real challenge but I'm proud of the final quilt and I'm really looking forward to seeing it in everyone's different fabric choices. 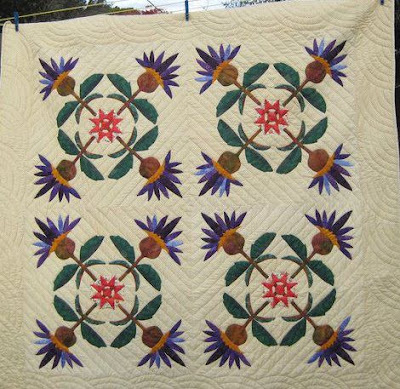 The quilt is called Pacific Stars, which may give you a little clue as to some of the block shapes. The colours I chose are blues, teals and purples - colours that remind me of the Pacific ocean - but that's not to say it couldn't be done in a completely different colour way. It could, and I'd love to see it in oranges and reds. Or browns and blues might be interesting! Anyway. There is no sign up needed, but you'll need to head over to Carol's Quilts to get the clues every month. I recommend you sign up to her monthly newsletter, that way you won't miss when a new clue comes out. The quilt is 56" when finished, so a totally doable size and the clues are one a month, with eight 8" blocks being the maximum each time, so not overwhelming. It would be great if people could share photographs of their work during the mystery and the best place to do that is probably Carol's Facebook page, so go and 'like' that too. I'd love it if you'd join me in this adventure! 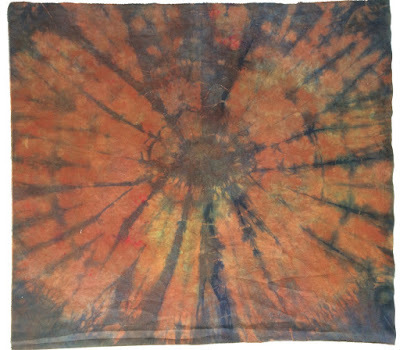 Because dyeing results are the product of so many variables: dilution, type of fabric, temperature, manipulation of fabric, age of dye etc, there is always a bit of serendipity. Plus, if you are constantly experimenting to see if you can get new and interesting patterns, you are sometimes going to get ugly. It's a shame I can't find a picture of this piece of fabric before I added the blue. But I probably didn't take one because it was such an uninspiring, insipid yellow. It's a half metre piece, so I folded it in half and then formed some sort of circle shape that I fastened with rubber bands (I can still see the rubber band marks) and over dyed it with navy blue. Hmmmm. Still pretty uninspiring. The contrast was pretty wild, I couldn't ever see myself finding a use for it in my studio, so I stuffed it back into the 'one day I'll overdye it' bag. Well, the brown one still has quite a defined pattern, but the contrast is taken down a peg or two and it almost looks like a wood grain/end of log pattern. I could imagine finding a use for it now. But the black! The black I call success! There is a subtle richness to it with hints of lots of different colours throughout. You can almost see the original blue pattern but only just. There is nothing flat or dull about this dark colour (you might have to see it up close and personal to really appreciate the fullness of colour - you know what they say about photographs and doing justice and all that). So. 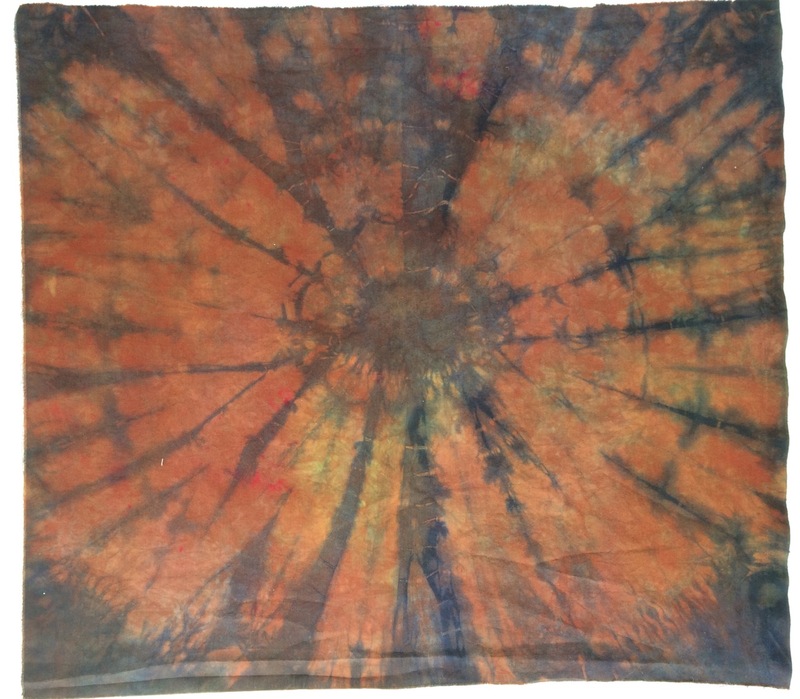 Did you dye an ugly piece of fabric? Well, just keep dyeing it until you get something you like. If all else fails - go black!